I've recently come back from a trip to Kerikeri. I was invited up to do a workshop by SLANZA Te Tai Tokerau. Actually, I ended up presenting on three topics because I gave them a few things to choose from and they chose them all! It was done on a site called Canva, which is worth having a look at. Julia also taught me that vegan meals can taste delicious, when she invited me to a very scrummy dinner. And lastly I got some great ideas from looking around her library, which hosted the event. I love the way these displays bring the online world into the physical environment. I was impressed by how the event was set up. Rather than sitting in rows of seats there were tables to sit around. Jeannie, the National Library's Programme Adviser for Northland, made sure everyone at each table had introduced themselves to each other. After each of my talks there was time built in for people to chat with each other about any thoughts they had and ideas they might like to implement in their libraries. We also had time to hear from a public librarian who had interesting things to add to my talk on gamification. At the end of the event there was a raffle for books that had been donated by various committee members. There were so many books that everyone who bought a ticket won at least one book, and I won three! Best of all you got to go up and pick a book rather than be given one that might not be suitable. As there was a committee meeting taking place after the event Jeannie and Julia had organised to bring soup so the committee could have some lunch. They extended the offer of soup to everyone and this was a big hit. A lot of people stayed and chatted, and it was a nice alternative to having everyone meet up at a cafe. So, I got to see how a different SLANZA region ran an event, and I found that extremely worthwhile. I will bring these ideas back to my own committee and see if we can use some of them. I'd like to say a big thanks to Jeannie, Julia and everyone else I met at Kerikeri. I had a wonderful time and they made me feel very welcome. 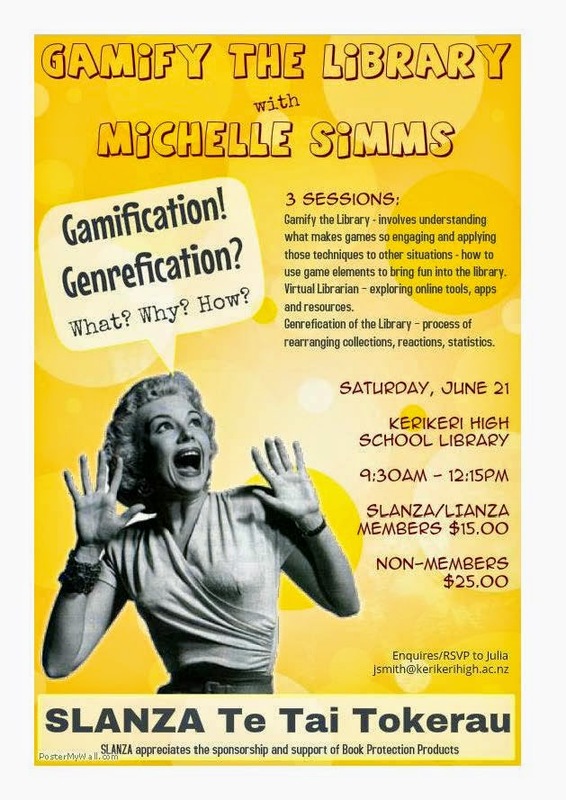 *But if you are interested in what I was presenting about, here is my virtual library tour and my talks on gamification and genrefication.